PipCoin Review - What Is PipCoin? Is It a Scam? Publish Your Content on MYF? PipCoin Review – What Is PipCoin? Is It a Scam? What is PipCoin? The company is relatively new on the market. Should you trust PipCoin and invest your money in this investment program? Read my PipCoin review and find out why you should avoid this investment scam. PipCoin describes themselves as an “Africa’s first P2P Cryptocurrency”. The information on the official website is rather vague and has no information on the products or services they offer. PipCoin is relatively new on the market and it is a brain child of David Schwartz and Ref Wayne Nkele who founded the company. I tried to look for the profiles of the founders and only Ref Wayne Nkele appears to be the face of the company, I couldn’t find any information on David Schwartz. As I browsed through the website, I could sense that they mainly focus on their affiliate commissions and their investment ROI that reads 35%. The funny mechanism is that PipCoin affiliates have to remain their coins in the system in order to receive the monthly ROI. When you invest in PipCoin in the first 24 hours, they pay out a 5% bonus. You can withdraw your earning (ROI) by cashing out your PipCoin with their internal exchange rate system. It does sound like all you need to do is to invest your hard earned money with PipCoin, sit back, and collect 35% ROI every month. Do this sound great to you? Read on to learn more about this PipCoin scam. You should not trust this investment company. The PipCoin is a scam. It is a fake investment company. From the official website, one can notice it is an HYIP investment scam that aims to steal your hard earned money. PipCoin is very new and looking at the date of registry, it was registered March 08, 2016 and expiring on November 13, 2017. According to Whois record of Pipcoins.com, public access to PipCoin ownership data is restricted due to privacy matters. I have tried to search for the company information on the internet and nothing shows up. This is a clear warning that the scammer does not want to reveal his or her real identity to avoid detection. PipCoin affiliates who recruit new affiliates are paid a percentage of the funds newly recruited affiliates invest. This percentage commission is paid out via an uni level compensation structure. If any level 1 affiliates recruit new affiliates, they are placed on level 2 of the original affiliate’s uni-level team. If any level 2 affiliates recruit new affiliates, they are placed on level 3 and so on and so forth down. That’s how a typical Ponzi scheme is operated. They recruit new members to sustain the pyramid scheme. They need “new” money to generate “returns” for the older investors by acquiring new investors. It is a fraudulent investment scheme where they pay returns to its investors from new capital paid to the operators by new investors, rather than from profit earned through legitimate sources. It is a pyramid scheme that typically collapses in the end because it requires exponential increases in participants to sustain the business model. That simply means the scheme cannot go on forever. The PipCoin probably still pays their investors for now as the program is still relatively new on the market. When there is insufficient investment fund from the new recruitment to the older investors, the entire structure will collapse. Obviously, there is a lack of details on how PipCoin manage the money from the investors. PipCoin tends to be vague about the strategies used in their program. I tried to look for more information “About” PipCoin, all I got is just a vague information. Furthermore, they are not backed by a real and verified trader. There is no proof and information at all on who are running behind the scene. This is your hard earned money, please do not be afraid to ask questions. A genuine financial professional will usually be happy to explain in detail the investment program they are marketing. Unfortunately, PipCoin fails to do so. I have years of experience in investments. Historically, investments in most large corporate stocks return less than 10% per year. Usually, HYIP scams offer between 1 percent to 2 percent daily profits to its members. As for PipCoin, they offer up to 35% interest monthly, of which it is a total nonsense. The ROIs that they claim on the official page clearly indicate that the investment is actually a Ponzi scheme or a junk bond that may never increase in value and has a high rate of default. I am not a fan of these HYIP programs. It is very rare that I recommend them because there are some things you need to know before you dive into this and throwing your hard earned money around. Every investment carries some degree of risk, which is reflected in the rate of return you can expect to receive. If your money is perfectly safe, you’ll most likely get a low return. High returns entail high risks, possibly including a total loss on the investments. Fraudsters like PipCoin spends a lot of time trying to convince people that extremely high returns are “guaranteed” or “can’t miss.” They try to plant an image in your head of what your life will be like when you are rich. Based on my observation, it is very clear that PipCoin is an investment scam. I reviewed some other similar HYIP in my blog too like Amazing 5 and Capital7. They both work the same way as PipCoin . By the way, Amazing 5 started 6 months ago and now it is official shut down. It is now gone with a lot of money from many victims. This is a prime example of how these HYIPs scam your money. Why do people keep joining HYIPs knowing that they are Ponzi schemes? All these Ponzi Schemes are aimed at people who want to get rich quick and do not want to take the tried & tested route of – hard work = success. Most people want to make lots of money quickly and the legal options are often very limited (e.g. Lottery). When a product promises to give you exorbitant returns, people tend to believe it due to our greed. However, most of the people end up losing their savings and hard-earned money. I wrote an article on How to Invest Online Without Being Scammed. This should serve as a reference when you look for a legitimate investment company on the internet. I don’t like the reliance on a Ponzi scheme in order to make bad money. Instead, I do affiliate marketing (it’s different) and rely 100% on myself to build an income online. If you are interested in alternative ways to generate a real passive income online, you might want to consider running your own legitimate online business. One powerful way to do this is through an approach called affiliate marketing. Affiliate marketing lets you earn money by promoting products from other companies. Any product you promote is going to be based on your opinion, and you are not required to stick with just one company. If you’re looking for a legitimate way to make money online without trying to qualify for online surveys or getting scammed by HYIPs then Wealthy Affiliate might be what you’ve been looking for. When I carried out my initial investigation on Wealthy Affiliate, it was purely to see if the company was legit for a few friends of mine, however, I didn’t imagine that I was going to make much or ANY money with them when I first got started, but as it turns out – I did. Well, I’m happy to say that I’m not the ONLY one making money in Wealthy Affiliate, as you can see from the pics below, and you’d be surprised at HOW many other people are making money too. Just like Amazon, WA allows you to generate income as its affiliate member. Meaning, that if you make a sale, you receive a commission. If you don’t make a sale, you don’t make a commission. The monthly investment to gain access to all the bells and whistles of WA is $47/month. You have the option to pay upfront and gain access to a yearly membership while saving on the total investment. Here’s the commission breakdown for the sale of each membership. Here is a hypothetical breakdown of “monthly” income statistics for you based on just a 4-month recurring monthly membership commissions. I personally find I make more commissions through WA than Amazon as the training modules are solid and most of them stay with WA for more than a year. Here are my recent affiliate commissions rewarded from WA. I generated $5,886 in my last 7 days and it’s actually ramping up over time. As long as people are still a member of WA, I get rewarded the recurring monthly commissions. This is what I meant by sustainable income. There are more than three billion internet users around the globe. Making 1 sale per day is not difficult at all with the blueprints and the step-by-step guide from WA. If this is an area you’re interested in, you could learn more about this through my 7-day free email course or you could join the program here. 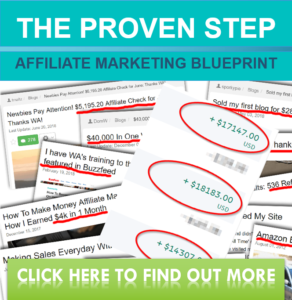 The guide is an excellent way to learn all the ins and outs of affiliate marketing and to get started in the field yourself. Interested to know how make sustainable income online? Where Should I Send You The Course? E-Dinar Coin Review – What Is E-Dinar Coin? Is It Real or Just a Scammer’s Plot to Steal Your Money? Rat Race Rebellion Review: Legitimate Site to Find Work From Home Jobs? INSTAR Wallet Review – Legitimate Platform to Earn Crypto via Surveys?